The Ea By-Pass Oil Filter (EaBP) provides the best possible filtration protection against wear and oil degradation. Working in conjunction with the engine's full-flow oil filter, the AMSOIL Ea By-Pass Filter operates by filtering oil on a �partial-flow� basis. It draws approximately 10 percent of the oil pump's capacity at any one time and traps the extremely small, wear-causing contaminants that full-flow filters can't remove. The AMSOIL Ea By-Pass Filter typically filters all the oil in the system several times an hour, so the engine continuously receives analytically clean oil. When used in conjunction with AMSOIL motor oil and an AMSOIL EaO or Donaldson Endurance� filter, the EaBP Filter should be changed every other full-flow filter change up to 60,000 miles. 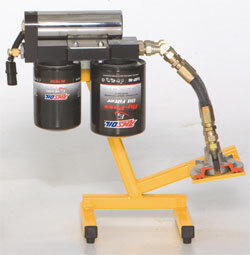 When used with other brands of motor oil or full-flow filters, the EaBP Filter should be changed every other full-flow filter change. AMSOIL recommends using oil analysis when extending oil drain intervals. AMSOIL has designed a new high-efficiency by-pass filter element that is also a soot removal device. AMSOIL Ea By-Pass Filters use a synthetic/cellulose sandwiched media. The inner layer of the element is composed of a highly efficient cellulose media covered with a full synthetic media outer layer. These filters remove 39 percent of soot contaminants less than one micron. Soot removal efficiency increases approximately 10 to 14 percent when the EaBP Filter is used in conjunction with a standard full-flow filter. EaBP-90 Diam. = 4.3 in. EaBP-100 Diam. = 4.3 in. EaBP-110 Diam. = 4.3 in. (2) EaBP-90 Width = 5 in. (2) EaBP-100 Width = 5 in. Height = 10 in. 3 qt. 15 to 30 qt. (2) EaBP-110 Width = 5 in. Height = 12 in. 4 qt. 15 to 42 qt. a. Filters can be used on sumps of larger capacity but then require more frequent replacement. Full details on service life included with filter installation instructions. 1. Special adapters and hardware may be required for some installations. 2. Contact AMSOIL INC. Technical Service for instructions before installing on vehicles with cast aluminum oil pans.